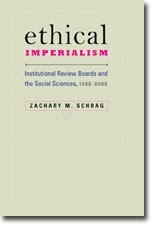 Ellen Marakowitz, a lecturer in the Department of Anthropology at Columbia University and a member of the Columbia IRB, reviews Ethical Imperialism for Academe, the magazine of the American Association of University Professors. She finds it "a well-documented history of the impact of institutional review boards on social science research in the United States," but wishes I had paid more attention to IRBs' potential to help researchers "think critically about their practices, including potential risks to subjects." Interesting thought, but I think it is IRBs' responsibility to promote their (unmet) 'potential to help researchers "think critically about their practices, including potential risks to subjects"' - rather than historians'.